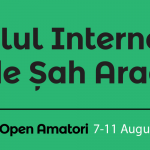 The 11th Arad International Chess Festival is a 9-round Swiss open taking place from 5-12 August 2018 in the Continental Hotel in Arad, Rumania. The event is organised by the Vados Chess Club Arad. In Group A 254 players took part. The winner is GM Levente Vajda with 7,5 points out of 9. Eight players have finished with 7 points. Second place is for GM Imre Balog and third is GM Dimitrios Mastrovasilis.